Riot has been busy lately. With 4.15, the League of Legends developer has buffed newcomer – and Gremlin – Gnar, introduced the new Master Tier and improved the client patcher. And, in an effort to minimise the eventual Summoner’s Rift update, some of the finished parts are being patched into the live game. 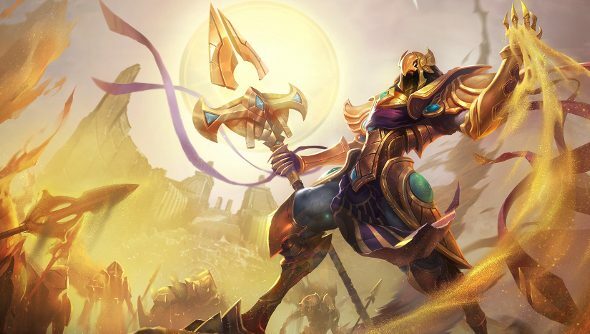 A new champion’s been revealed to boot: Azir, the Emperor of the Sands. He’s a snazzy-looking mage with a heavy Egyptian vibe. Being an emperor, Azir’s not one for getting his hands dirty. He’s a minion summoner, letting his soldiers take all the risks. These sandy warriors are tough troops, able to deal lots of direct damage, charge at foes and dish out some crowd control. Riot says it’s been able to make Azir’s minions so potent because they’re balanced out by trade-offs and weaknesses. Soldiers require player input, for example, so if Azir uses “Arise!” and summons a sand warrior, and then he’s stunned, or starts to run away, the soldier is no longer a threat. The goal for Riot is to offer players control over strong minions, but also create enough weaknesses so that enemies can be aggressive. For those times, Azir can be played defensively. His Emperor’s Divide ability summons a phalanx of shield-bearing warriors that charge at and knock back enemies, and then create a defensive line that blocks enemies dashes and movement while giving allies a speed buff. You can take a gander at the new patch notes right here, and if you want some ideas on how to play Azir when he arrives, then slap your eyes on this.